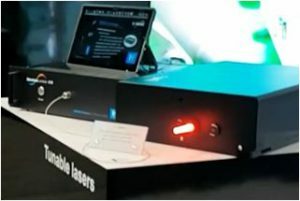 High performance lasers, tailored to your needs; through the well-known Swedish laser manufacturer Cobolt, a proven supplier of high performance lasers of more than 15 years, HÜBNER Photonics division offers one of the industry’s broadest ranges of compact single-frequency CW lasers, diode lasers and Q-switched lasers across the full UV-VisibleNIR spectrum. Using proprietary HTCure™ laser manufacturing technology the Cobolt lasers are associated with outstanding reliability and lifetime. Every light source you will ever need Complementing Cobolt’s broad portfolio of compact lasers. Combine the lasers in a highly flexible and extremly compact laser combiner. 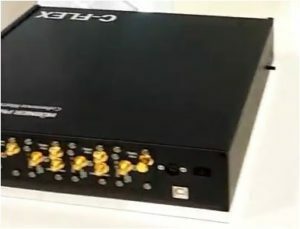 HÜBNER Photonics also offers one of the most unique kinds of lasers on the market – the award winning singlefrequency, CW, frequency doubled OPO, C-WAVE providing broadly tunable emission across the visible (and NIR) spectrum. By combining the competences across HÜBNER Photonics, volume manufacturing of exceptional laser designs with unparalleled reliability is a reality. C-WAVE is the tunable laser light source for continuous-wave (cw) emission in the visible and near-infrared wavelength range for a lot of applications, like atomic physics, quantum optics, spectroscopy or holography. The perfect research tool! C-WAVE tunable laser 500 nm – 740 nm with no gaps. Hübner Photonics is proud to expand the range of configurations for the compact and flexible laser combiner, C-FLEX. Addressing holography and Raman spectroscopy, these options include a high power (up to 1.5 W) red, green and blue (RGB) version with a choice of 3 wavelengths from the Cobolt 05-01 Series of single frequency lasers, and a compact version with a choice of 3-6 laser lines from the Cobolt 08-01 Series of diode pumped and narrow linewidth lasers. For Raman spectroscopy and holography: C-FLEX laser combiners. 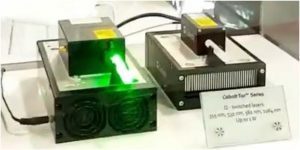 The Cobolt TorTM lasers represent a new class of compact high performance diode-pumped Q-switched lasers with multi-kHz repetition rate, pulse energies in the 100 µJ range, pulse widths of a few ns and very high quality beam (the main advantage being its substantially more compact size). Enabling photoacoustics! Tor XS 561 nm 30 µJ/pulse, <1 kHz.